The Notre Dame cathedral in Paris has been engulfed in flames, with a huge plume of smoke extending for miles from the iconic landmark in the centre of the French capital. As the flames spread along the roof of the building, the blaze toppled the spire at the top of the building while Parisians posted photos and video from around the city. Then, the roof itself collapsed. The images are dramatic, showing the 850-year-old church surrounded by bright orange, blacks, and a smoky haze. It remains to be seen how much of the invaluable art and artefacts inside of the building were removed before the roof came crashing down. This general view taken from Montparnasse Tower shows flames and smoke as they billow from the roof at Notre-Dame Cathedral in Paris on 15 April, 2019. People look at smoke and flames rising during a fire at the landmark Notre-Dame Cathedral in central Paris. People react as they watch flames engulf the roof of the Notre-Dame de Paris Cathedral in the French capital. People cry and pray as they look at flames burning the roof of the Notre-Dame Cathedral. Sparks and flames are seen through a destroyed stained glass window as the Notre Dame Cathedral burns. Firefighter douse flames billowing from the roof at Notre-Dame Cathedral in Paris. A view of Notre-Dame Cathedral on fire as seen from Montmartre in the east on 15 April, 2019 in Paris, France. An onlooker uses a telescope to film the fire at the Notre-Dame Cathedral. A man watches the landmark Notre-Dame Cathedral burn, engulfed in flames, in central Paris on April 15, 2019. – A huge fire swept through the roof of the famed Notre-Dame Cathedral in central Paris on April 15, 2019, sending flames and huge clouds of grey smoke billowing into the sky. The flames and smoke plumed from the spire and roof of the gothic cathedral, visited by millions of people a year. A spokesman for the cathedral told AFP that the wooden structure supporting the roof was being gutted by the blaze. The steeple of the landmark Notre-Dame Cathedral collapses as the cathedral is engulfed in flames in central Paris on April 15, 2019. – A huge fire swept through the roof of the famed Notre-Dame Cathedral in central Paris on April 15, 2019, sending flames and huge clouds of grey smoke billowing into the sky. The flames and smoke plumed from the spire and roof of the gothic cathedral, visited by millions of people a year. A spokesman for the cathedral told AFP that the wooden structure supporting the roof was being gutted by the blaze. The landmark Notre-Dame Cathedral is engulfed by flames in central Paris on April 15, 2019. – A huge fire swept through the roof of the famed Notre-Dame Cathedral in central Paris on April 15, 2019, sending flames and huge clouds of grey smoke billowing into the sky. The flames and smoke plumed from the spire and roof of the gothic cathedral, visited by millions of people a year. A spokesman for the cathedral told AFP that the wooden structure supporting the roof was being gutted by the blaze. Smoke billow and flames burn from the roof of the landmark Notre-Dame Cathedral in central Paris on April 15, 2019. – A major fire broke out at the landmark Notre-Dame Cathedral in central Paris sending flames and huge clouds of grey smoke billowing into the sky, the fire service said. The flames and smoke plumed from the spire and roof of the gothic cathedral, visited by millions of people a year, where renovations are currently underway. Flames and smoke are seen billowing from the roof at Notre-Dame Cathedral in Paris on April 15, 2019. – A fire broke out at the landmark Notre-Dame Cathedral in central Paris, potentially involving renovation works being carried out at the site, the fire service said.Images posted on social media showed flames and huge clouds of smoke billowing above the roof of the gothic cathedral, the most visited historic monument in Europe. Bystanders look on as flames and smoke billow from Notre-Dame Cathedral in Paris on April 15, 2019. – A major fire broke out at the landmark Notre-Dame Cathedral in central Paris sending flames and huge clouds of grey smoke billowing into the sky, the fire service said. The flames and smoke plumed from the spire and roof of the gothic cathedral, visited by millions of people a year, where renovations are currently underway. People watch the landmark Notre-Dame Cathedral burns in central Paris on April 15, 2019. – A huge fire swept through the roof of the famed Notre-Dame Cathedral in central Paris on April 15, 2019, sending flames and huge clouds of grey smoke billowing into the sky. The flames and smoke plumed from the spire and roof of the gothic cathedral, visited by millions of people a year. A spokesman for the cathedral told AFP that the wooden structure supporting the roof was being gutted by the blaze. Smoke and flames rise during a fire at the landmark Notre-Dame Cathedral in central Paris on April 15, 2019, potentially involving renovation works being carried out at the site, the fire service said. – A major fire broke out at the landmark Notre-Dame Cathedral in central Paris sending flames and huge clouds of grey smoke billowing into the sky, the fire service said. The flames and smoke plumed from the spire and roof of the gothic cathedral, visited by millions of people a year, where renovations are currently underway. People watch the landmark Notre-Dame Cathedral burning in central Paris on April 15, 2019. – A huge fire swept through the roof of the famed Notre-Dame Cathedral in central Paris on April 15, 2019, sending flames and huge clouds of grey smoke billowing into the sky. The flames and smoke plumed from the spire and roof of the gothic cathedral, visited by millions of people a year. A spokesman for the cathedral told AFP that the wooden structure supporting the roof was being gutted by the blaze. Smoke rises as people watch the landmark Notre-Dame Cathedral burning in central Paris on April 15, 2019. – A huge fire swept through the roof of the famed Notre-Dame Cathedral in central Paris on April 15, 2019, sending flames and huge clouds of grey smoke billowing into the sky. The flames and smoke plumed from the spire and roof of the gothic cathedral, visited by millions of people a year. A spokesman for the cathedral told AFP that the wooden structure supporting the roof was being gutted by the blaze. Flames on the roof of the Notre-Dame Cathedral in Paris, France, 15 April 2019. A fire started in the late afternoon in one of the most visited monuments of the French capital. A statue of Saint John is removed from the spire of Notre Dame cathedral by a crane before restoration work, in Paris, France, April 11, 2019. Flames and smoke are seen billowing from the roof at Notre-Dame Cathedral in Paris on April 15, 2019. 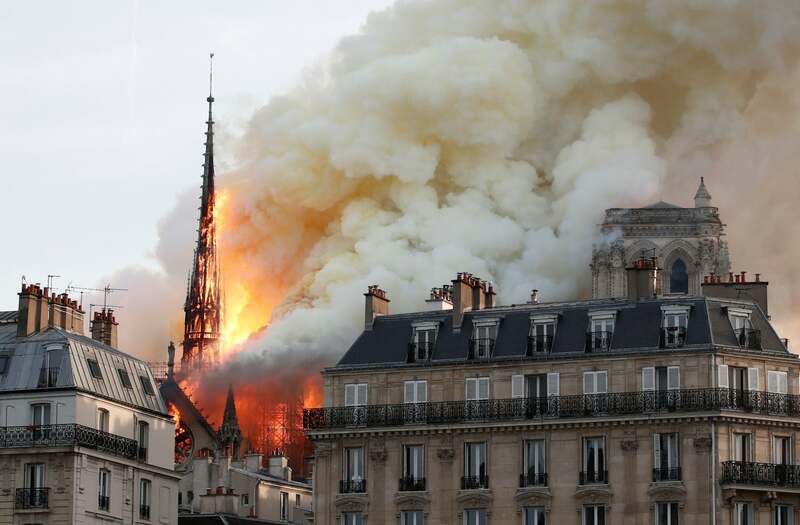 – A fire broke out at the landmark Notre-Dame Cathedral in central Paris, potentially involving renovation works being carried out at the site, the fire service said. Soon after the blaze began, French President Emmanuel Macron cancelled a planned address to the nation, and an investigation was announced before the blaze had even been put out. The fire prompted an outpouring of grief from across the globe.